Do you sometimes get stuck right before you take action? Do you hesitate? Do you hold back? Does the fear get too great right before you pull the trigger and do the thing that you want to do? If so, you’re going to want to watch this episode, because inside, I’m going to show you one powerful way to know how to break through that fear and how to get into the action that you want in any area of your life so that you can skyrocket your confidence. Welcome to another episode of The Art of Extraordinary Confidence. 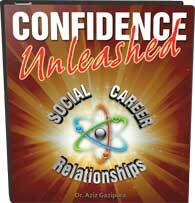 I’m your host, Dr. Aziz, best-selling author and the founder of The Center for Social Confidence. This is the show for you if you want confidence, if you want to maximize your confidence, if you don’t want to just dabble but you actually want to master this area of your life, which I think is hands-down the most important area of life to master. Because once you’ve mastered your confidence, then you can not only achieve everything you want, but you can also enjoy what you’re achieving. So many people can achieve, but then they still don’t like themselves and they still feel bad inside. We’re fixing all of that, and I’m glad you’re with me. Subscribe below if you want to stay current with all the videos that I’m putting out. In this video, we’re going to talk about something that is really going to help you get into action. Here’s what it is. The most important thing to do now is imagine that there’s a line right here, and this is the action. This is the moment of action. This is when you’re going to do that thing. And I don’t know what it is for you, but you know. If you were bold and confident and powerful, what is that thing that you would do? Is it to approach that person you find attractive and start a conversation? Is it saying something in that meeting, being bold, being direct? Is it just putting yourself out there in a bigger way for your business, whatever it is? So there’s that moment of action. Here is something that you must understand about the process. It’s that as you get closer to that moment of action and you’re getting closer and closer, here’s your fear. It starts to build as you get closer and closer. It almost looks like one of those exponential curves where as you get closer, it gets higher and higher and higher. And as you get closer and closer and closer to that moment of action, your internal experience of fear is going to get higher and higher and higher. We’ve all experienced this, right? You’re going to give a presentation and you’re feeling nervous a couple days before, or that day, or a couple of weeks before. That was my experience for a long time with presenting. And then it’s that moment right when they call your name or right when you get up to the stage or right when you’re going to start doing your presentation. Boom, all that fear hits. Here’s why this is so important to note. Most of the time when we’re not taking the action that we want, the fear starts to build, starts to build, and what do we do? We press the eject button and we peel right off, and then when we do that, we don’t take the action. And that actually holds us up or shoots us in the foot in a couple of different ways. One, we didn’t take the action. Now you didn’t take the risk and you don’t get the result that you wanted, whether it’s a date or to improve your career or whatever it is that you want. If you don’t take the action, you won’t get the results. The second one is sneakier but causes even more damage in the long run. Each time you avoid it, you’re training your brain, you’re training your whole nervous system to say, “OK, when there’s a lot of fear, I shy away. I avoid.” You’re training your body to respond to fear with avoidance, and that is the exact opposite of what we want to do if we want to have extraordinary confidence. 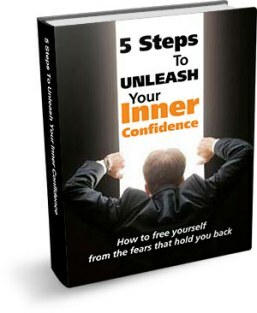 If you want to have extraordinary confidence, you want to train your nervous system to be able to take action in the face of fear while holding and experiencing fear in your body, all throughout your chest and your stomach, and it’s harder to breathe. You can still take that action. So what we want to do is it gets bigger and bigger and bigger, and then you still take that action. Another pitfall that I’ve seen in people is we take that action, and then we expect the fear to go like this and just disappear. I’m supposed to just feel great. And unfortunately, and I’m sure you’ve experienced this before, sometimes that happens, which is great, but sometimes it doesn’t. Sometimes you’re still doing the thing, you’re talking to that person that you found attractive, but instead of being in the moment and having a flowing conversation and being yourself, you’re tense, you’re uncomfortable, and you’re nervous. It’s the same thing with the sales call, the same thing with that conversation that’s more authentic that you want to have with your team or your employees, whatever. It’s the same. It’s uncomfortable as you’re doing it. And then what do we do? This is the second mistake that we make. We just blast off and we exit the conversation. We exit the situation prematurely. “I’ve got to get out of here. Let me get out of here.” And when we do that, we’re again shooting ourselves in the foot, because now we’ve trained our body that when it’s uncomfortable, get out. Again, it’s another form of avoidance training, and the last thing you want to be doing is avoidance training, because that’s just going to further intensify the walls of your comfort zone and make it harder to get out. So what we need to do is take action over that moment. Let the fear build, but still take the action. Then stay in it, as best as you can with all this stuff. And what I’m a big believer in is reducing the intensity, so if it’s too much to climb that mountain, pick something smaller. Pick a smaller action. Pick a lighter load. Just do what you can, but that same process is going to occur, at just a less intense level. So whatever you can handle, you do that, and then you don’t eject early. You stay in it. And what helps you to do this, because I know that’s challenging and I’ve experienced it and I still experience that – it’s challenging. The way to get through that, I think, is to remember that this particular situation, this conversation, this date, this presentation, this job, this customer, this boss, this one thing is not your entire life. It’s not the end of the road. It’s not like you’ve got to get it now or you’re screwed forever. If your mind is saying that, which our minds do, it’s a lie. It’s building up a false sense of urgency. It’s got these crazy beliefs going on that we’re buying into. It’s not actually true, because the truth is that there’s a process. So you could stay in it, and it’s awkward and it’s uncomfortable and then it doesn’t go well, and you get out. OK, great, you just built a ton of muscle right there by doing that. You want to know that this is a part of a process. Even if this time is awkward, even if this time doesn’t go well, if I don’t escape, if I don’t exit, I’m training my whole body, my mind, my emotions, my nervous system to stay in it, to move toward what scares me, which happens to also be toward everything that you want. Use this awareness from this video to stay in action, to stay in the situation, every time. Train yourself repeatedly over time and you’ll notice that you have so much more freedom, because it doesn’t matter if you feel fear. You can still just go do that thing and fear has no power to stop you. So share below what you’re learning from this, what you’re going to apply in your life, and any questions you have. We can all help each other out. And also subscribe below if you want to stay current with all the videos that I’m putting out now and just keep mastering your confidence to higher and higher levels.